No boat, no waves, no wind… no problem. As the first electric, jet-propelled wakeboard, the Wakejet combines the agility and speed of riding behind a boat with the freedom of surfing. We were asked to take it from prototype to market – and were taken for an awesome ride. The advantages of battery-powered motors over standard fuel motors are innumerous. Clean, silent yet extremely powerful, they come with negligible operating costs and a minimum of maintenance. That said, combining high-power batteries, salt water and the human body is rather tricky. What did make things easier were the cool prototypes that Radinn had already developed. Our mission was to develop a full product, complete with mechanics, electronics and software, and make it available to a global market. We wanted to translate the Wakejet’s strong, powerful technology into a fun, easily controlled experience – even for people new to wakeboards. Speed and acceleration are controlled via a handheld remote control, with a progressive lever button. Its inner silicone body keep things 100% watertight. Charging is simple – just place the remote on the inductive charger. Radinn’s specially-developed mobile app gives even more control, allowing users to set their preferred acceleration level and top speed from their mobile phone. 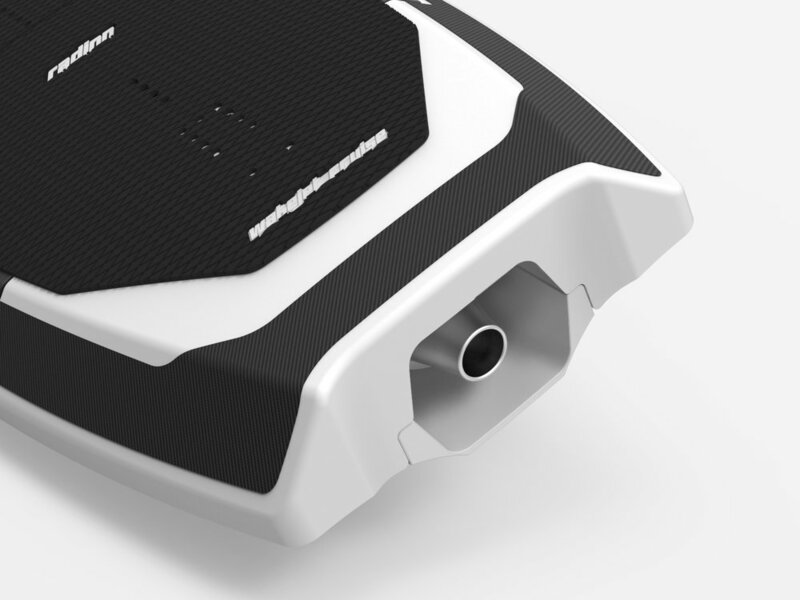 Right down to every little detail, the Wakejet is a technological piece of art. The board itself is made of the strongest and most lightweight composites in the world. Basically every component is custom-built and manufactured by hand. And thanks to the simple, intuitive controls and app, both experienced wakeboarders and complete beginners can get the most out of their Wakejet ride by adjusting settings like acceleration curve and speed limits. Say goodbye to the noisy engines of earlier powered surfboards and hello to the future. The Wakejet is swift, agile, lightweight, maintenance-free and amazingly robust – with zero emissions. Cruising along canals or even up rapids is a breeze with the Wakejet. Inside its tough carbon fibre shell, lithium polymer batteries supply the motor with power that could charge 650 iPhones in a mere 20 minutes. An onboard computer system keeps track of vital stats such as motor efficiency, amperage, peak currents, GPS position and the temperature of the different internal components. If something unexpected should occur, such as a foreign object entering the jet, the system shuts off automatically to avoid internal damage. Radinn was founded from a life-long dream of shredding across the water independently from the wind, waves, or boat. Original founder Philip Werner met with enthusiast Alexander Lind, who together created a team of extreme sport fanatics - who also happened to be engineeres, entrepreneurs, supply chain specialists, industralists and financiers. Sign up to keep in the loop of news and inspirational goodies.